Utah drivers: Give me a break! I ride a bicycle. A lot. I commute to work by bicycle more than 50% of the time. Last year I rode more than 3000 miles. I started riding again 2 years ago, and with all my safety gear and safety mindset, I’ve been incident free. I believe that no driver out there wants to kill a bicyclist, and I also believe that the reflective gear I wear helps drivers to be aware. Generally that means that on the road, drivers give me plenty of room. But still, Utah drivers: you can be better! I know … I know. Bicycles are rare here. I know. We love our SUVs here, and will be driving them until the last drop of oil has been drilled. But wake up! You can do better at sharing the road. Recently, I spent a weekend in Portland Oregon. Portland is bicycle nuts! Bicyclists are everywhere! And drivers have adapted to sharing the road. It’s obvious. While there, I didn’t do any bicycling, but I did observe lots of friendly driving. I was amazed when walking back to Erin’s (my daughter’s) apartment after breakfast. We were walking north on a sidewalk approaching an entrance to a shopping area. We were yards away from the intersection, and yet, as we approached, a driver approaching the entrance and ready to turn into the lot WAITED for us to see if we were going to cross her turn path! Amazing. The last time this happened in Utah was probably some time around 1924. In contrast here, I was coming home from work on my bicycle one evening, and crossed the northbound I-15 off ramp at highway 193 with the walk light. Not a big deal of course, except for the possibility of drivers taking a free right without checking the crosswalk to their right. So as usual, I held back … getting either driver eye contact, or seeing that traffic would prevent a free right. No problem. Then 2 miles down the road while waiting for another light the driver of a UTA (Utah Transit Authority) para-transit bus opened up her door and said, “Was that you crossing the road back at 193? I just think you should know … you scared me to death back there! I was ready to turn, and there you were right in front of me!” OK. Well that was well intentioned, I guess I was being told that I should be normal, and drive a car. But here’s the situation. Yup there I was with a reflective orange vest, a reflective neon green helmet, a 20 watt halogen headlight, in a crosswalk with a walk light, and a professional driver wasn’t looking right to check the crosswalk while turning right! Wake up! Reflecting on this later, I realized that though the comment had scared me, I was indeed safe riding by my rules. I had assured that on coming traffic would prevent her from turning into me … and as it turned out I was just clearing her path as an opening cleared for her. No problem. But Utah, wake up. Pedestrians and bicyclists do exist. Choices. A man always has choices. 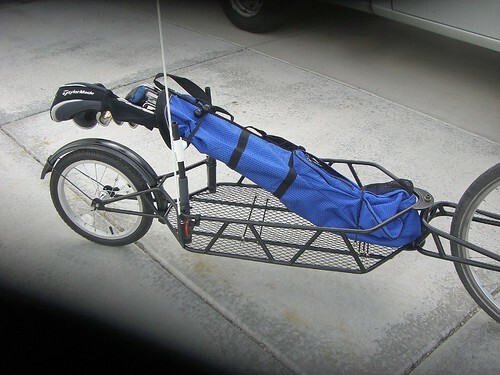 Well rather than choose golf over bicycling, or bicycling over golf … I combined the two. Questions. A man always has questions. Where do I rate on the eccentricity scale? 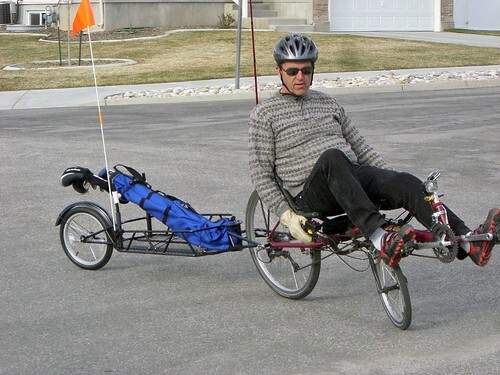 Is there anyone else in America riding an under-seat steering recumbent, towing a trailer, loaded with golf clubs while commuting to work? On Sunday I rode to Swan Lakes Golf Course, played 9, then continued on to Home Depot for some shopping. Today (Monday), I rode to work (5.5 miles). After work I rode to Swan Lakes (4 miles). I practiced at the driving range, and then rode home (6 miles). Since it’s been a long winter without much bicycling, I can feel it. It was a workout. During the last weekend of April, I performed a minor miracle for a body, who from time to time, has accepted middle age as a time of athletic regression. Not anymore. I rode from Pleasant View to Pleasant Grove (98 miles) then got on the bicycle the next morning and rode back! That was the culmination of training since last November, and proof positive that I could participate successfully in the Cycle Salt Lake Century. Now I say, I can look at middle age and spit in it’s face! Yesterday, I did in in fact, ride the 100-mile Cycle Salt Lake Century! The first 70 miles were really quite a bit of fun! The last 30, not unlike my Pleasant Grove ride, were pretty tough! It was a great event and a great day. Temperatures reached 90, and I drank about 1.5 gallons of water during the ride. My friend Troy, rode the entire event with me, even though he had been saying he’d do only the 66-mile option. Welcome back to century riding Troy! I was surprised at a number of things at this event — my first organized century ride. The sheer numbers of bicyclists was amazing (about 3000, I believe). For the first 20 miles on the road ahead I saw bicycles, bicycles, bicycles. In the rearview mirror I saw handlebars and pumping legs! There were quite a number of fat people riding. I’m not skinny — still 20 pounds overweight — but I was surprised to see folks who were 50+ pounds overweight riding the full 100 miles. The ride had 33, 66, and 100 mile options. So the numbers of riders was vastly larger in the first half of the ride. So was the variety in bicycles. I was a surprised to see (and hear …. squeak squeak) bicycles that had poor maintenance. The support for this ride was fantastic. Great rest stops and good food! Where ever we were on the ride, the support staff of Bingham Cycle shop was there to assist riders with mechanical and fatigue problems. Troy and I stopped twice along the route (other than at rest stops) Both times, a Bingham’s Cycle shop guy came by to ask if we needed help! A slightly used Vision R-40 (ATP) recumbent bike came my way on Nov 4. It has been a total kick! It took some “getting used to”, but after nearly 200 miles of riding, the two of us are becoming pretty good friends. The rides so far are documented in this spreadsheet. Today was the first Saturday with temperatures at 50 degrees. It’s hard to live on a golf course and not let go a little bit. By sunset there was enough grass just off the patio to knock a few across the pond with the 6 iron. You’ll just have to wonder what the diminishing snowman was saying about it all. water at a level above its midpoint. proceeded into the culvert where its roof was ripped off.